On a sunny Saturday morning over 100 volunteers and devoted GRID staff members came together for our 9th annual Solarthon. Solarthon is GRID Alternatives fundraiser and solar block party that brings together people from all walks of life. 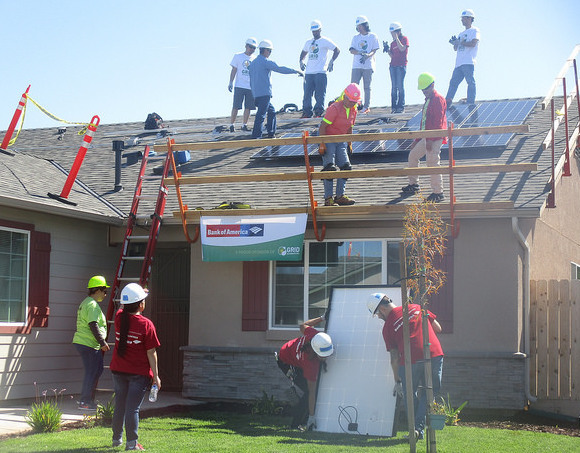 Individuals, corporate sponsors, job trainees, community leaders and the homeowners themselves, join together to install multiple solar photovoltaic systems in one community. This year’s event was held at the Parksdale Subdivision of Self-Help Enterprises in Madera, California. In the morning, we had a special visit from Max Rodriguez, Madera County District 4 Supervisor, who thanked everyone for the work we are doing in his community. GRID was once again, fortunate to have earned the support from partners throughout the region that included Wells Fargo, Enphase, Bank of America, Lifestyle Solar, CED, Sinclair Systems International, Beneficial State Bank, Solar Negotiators/Solar Maintenance Pros, Sun Power and Madera County Department of Corrections. At the end of the day, 86 solar photovoltaics systems have been installed in Madera County since opening GRID Alternatives Central Valley office in 2009. By the numbers, Saturdays installs had a huge impact, the eight projects totaled 23.6KW of solar production, which is the equivalent of 10,509 trees planted. Eliminating 452 tons of greenhouse gas emissions from going into our environment and saving the families $220,260 in life time savings. Not a bad way to end this year’s Earth Day weekend. Hard work, sweat and dedication by the volunteers and staff members helped get the job done. At lunch, everyone enjoyed ribs, BBQ chicken and tri-tip, which was catered by Ribs and Tips Catering. The food was great, but seeing the smiles of the families was the best part of the day. We want to thank all the volunteers, sponsors and staff members for a job well done. If you missed out on this year’s celebration be on the lookout for our 10th annual Solarthon, it may be coming to a community near you! !